An original composition by Amanda M. N. Wilkes, written in honor of Mrs. Darlene Deibler Rose, and taken from her book, Evidence Not Seen. You can listen to a sample here. 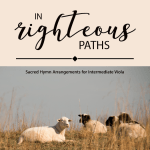 Arranged for SATB and piano. Suitable for church services, special occasions, and more. Be the first to review “I’ll Be with You” Click here to cancel reply.